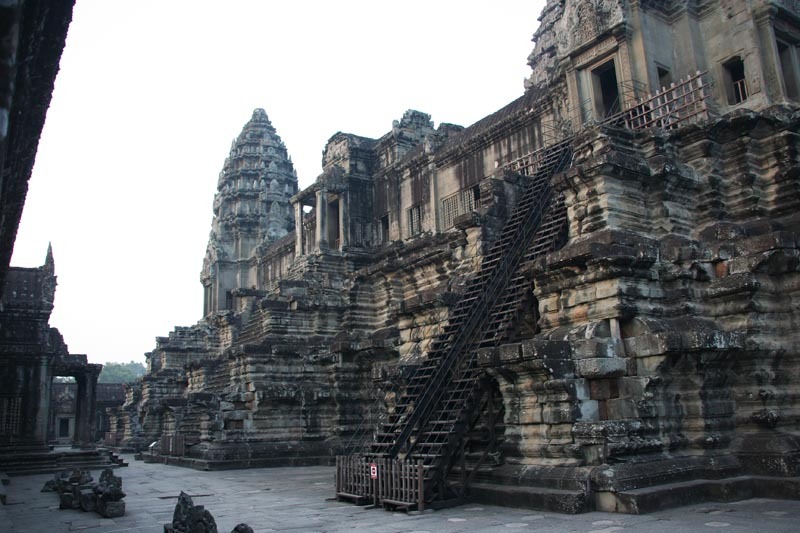 Temples of Angkor – Seventh Wonder of the World, Worlds largest historic site was built in 12th century by Khmer ruler Jayavarman II. 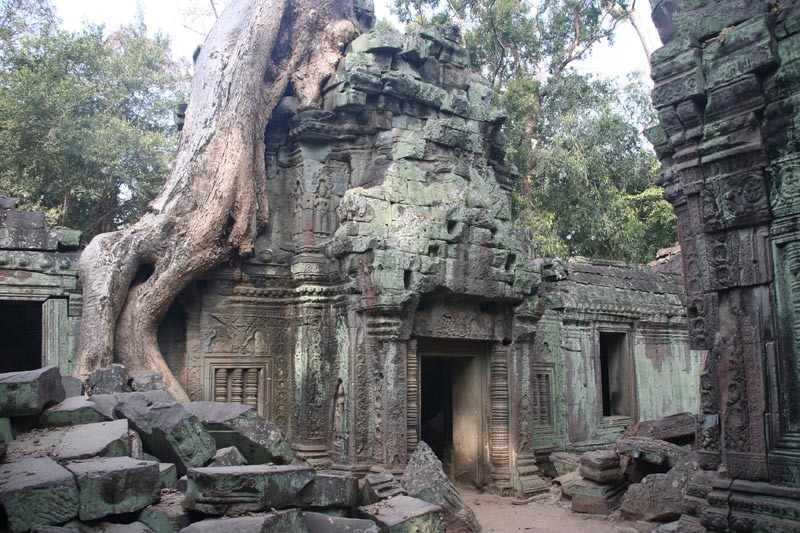 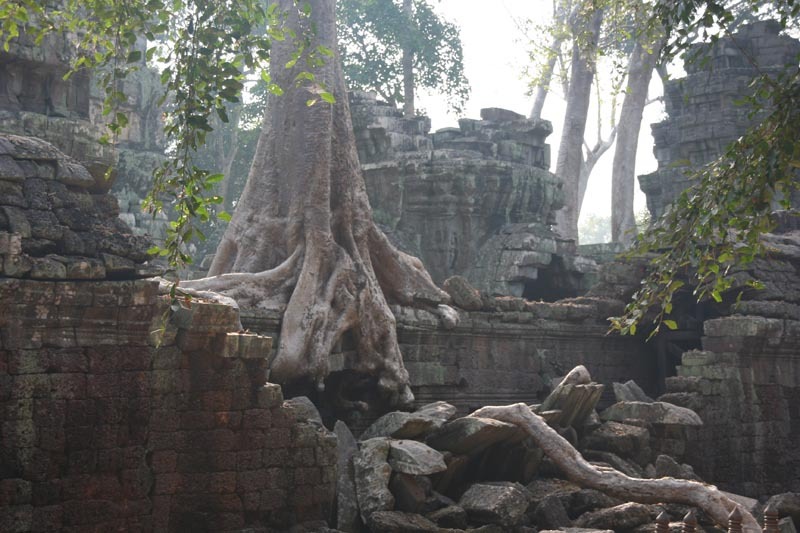 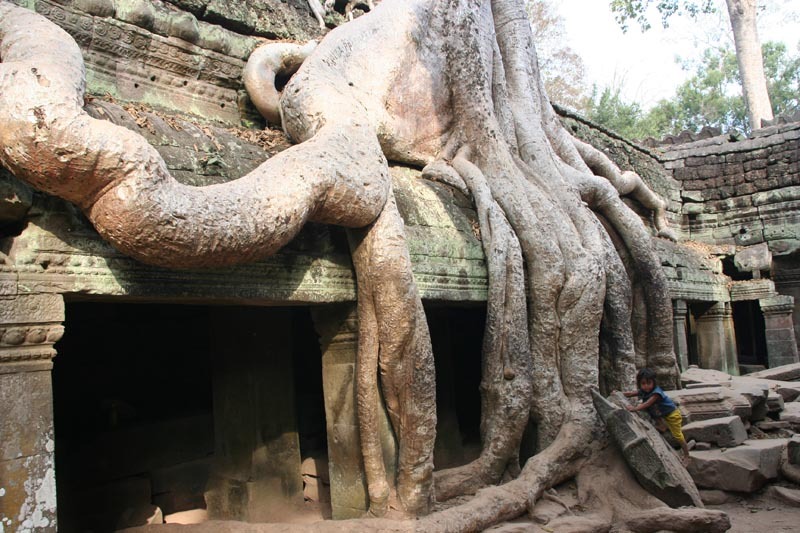 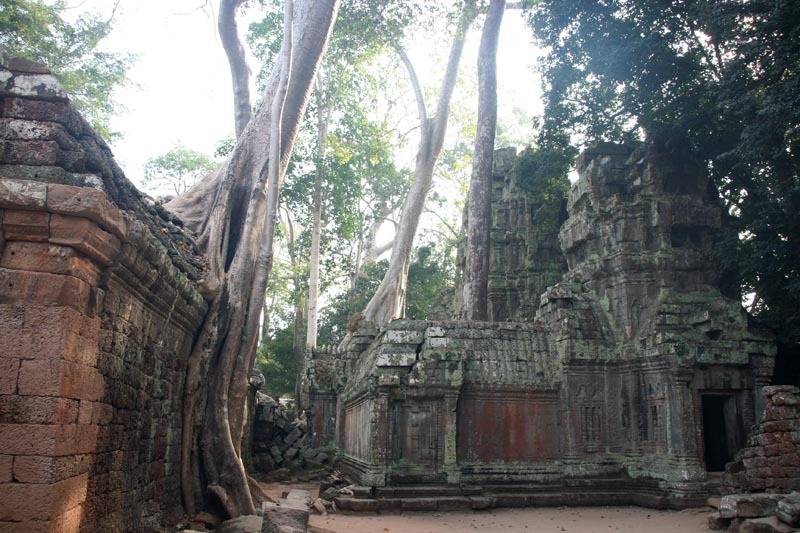 It was hidden in jungle until 20th century, when it was re-discovered and renovation started. 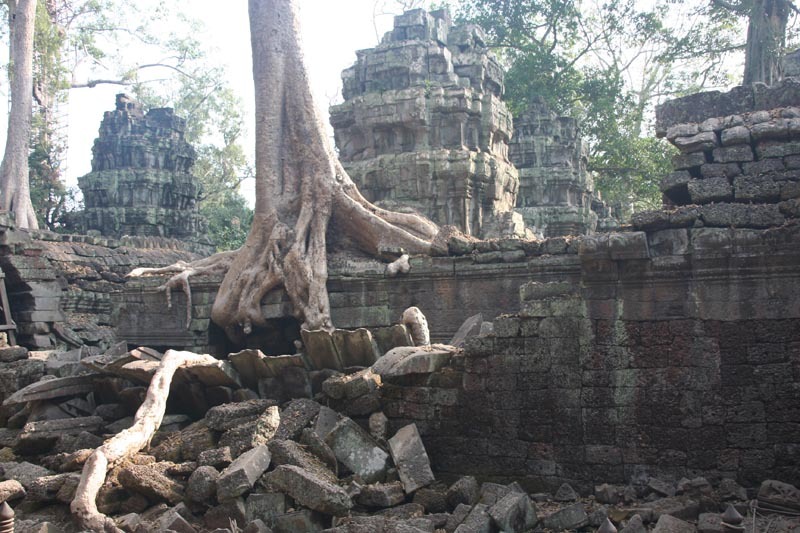 Unfortunately all renovation works were canceled during red Khmer period and today some pieces are re-assembled and left on ground stone by stone. 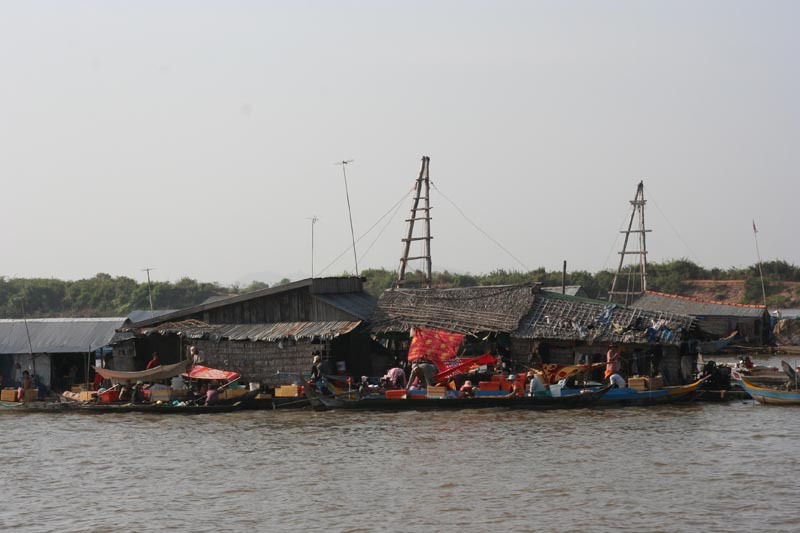 In Phnom Penh we step on the roof of speed boat. 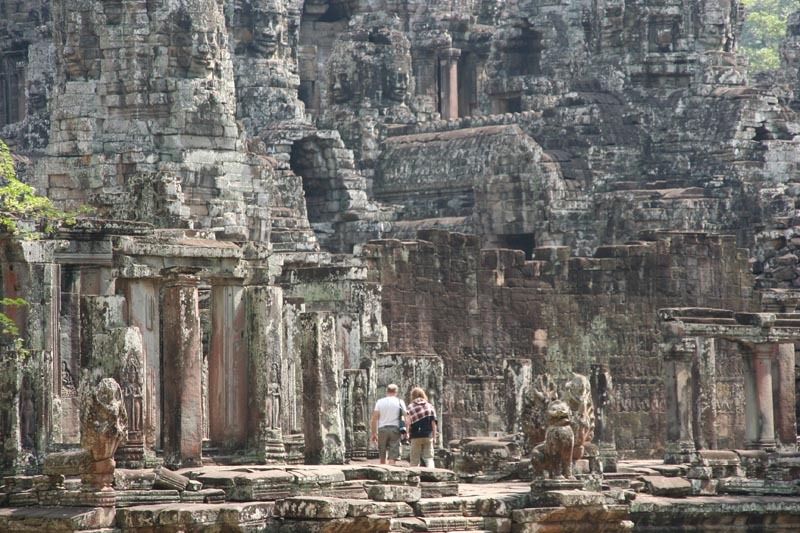 Next 7 hours we spend in intense motor roar and even more intense sun radiation to reach Angkor. 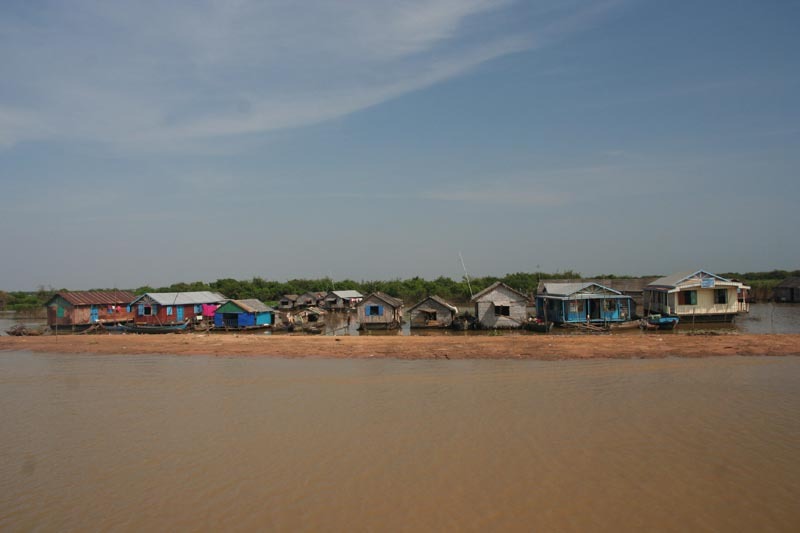 We go by one of Mekong’s tributaries and then cross huge Tonle Sap Lake, making in total 210 km and enjoining the most beautiful floating villages I have ever seen. 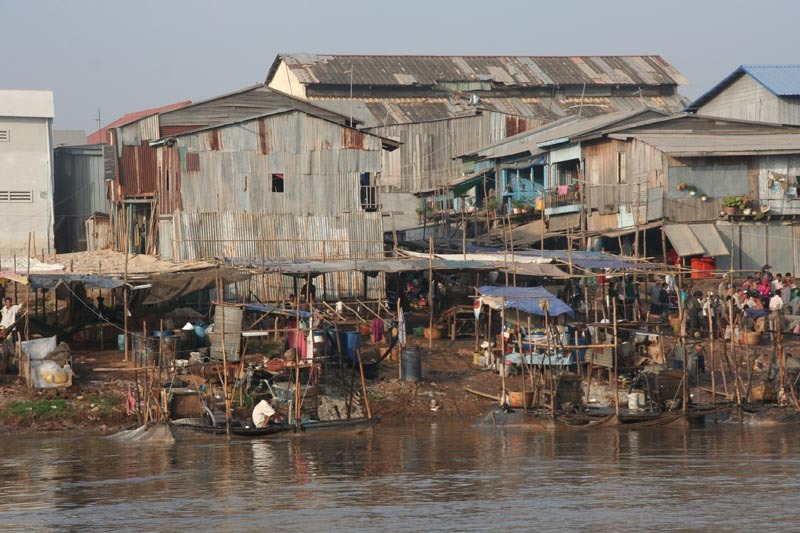 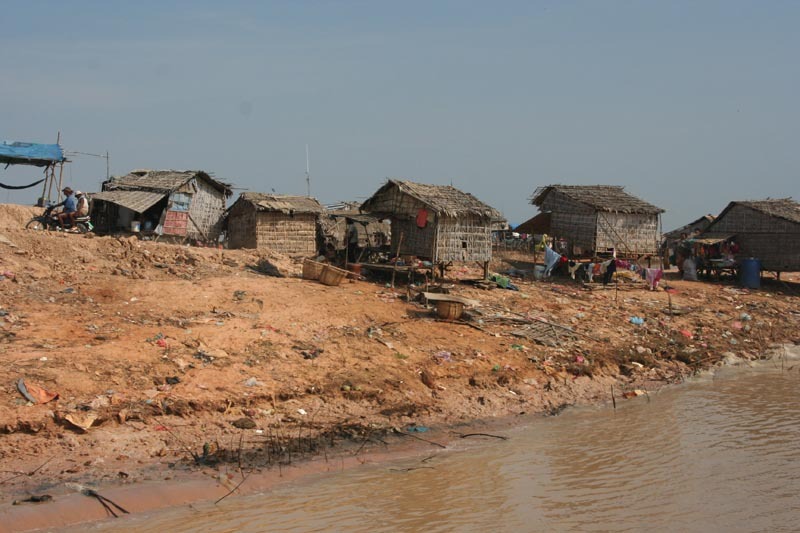 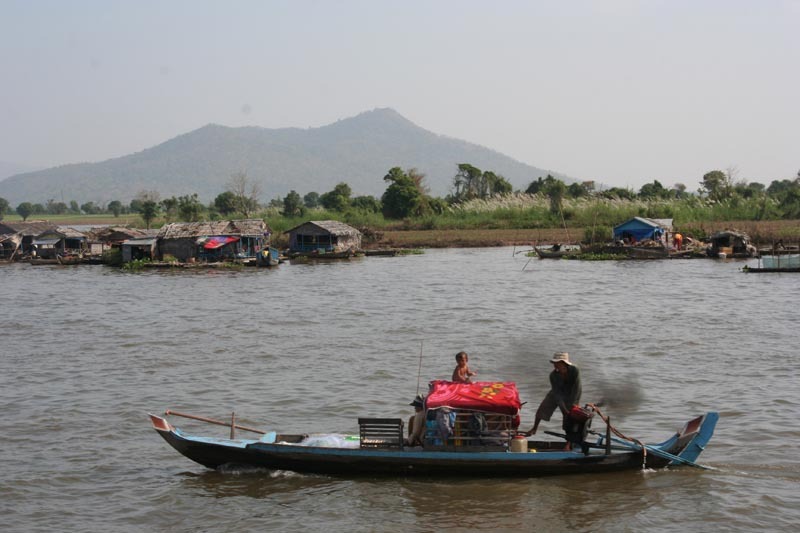 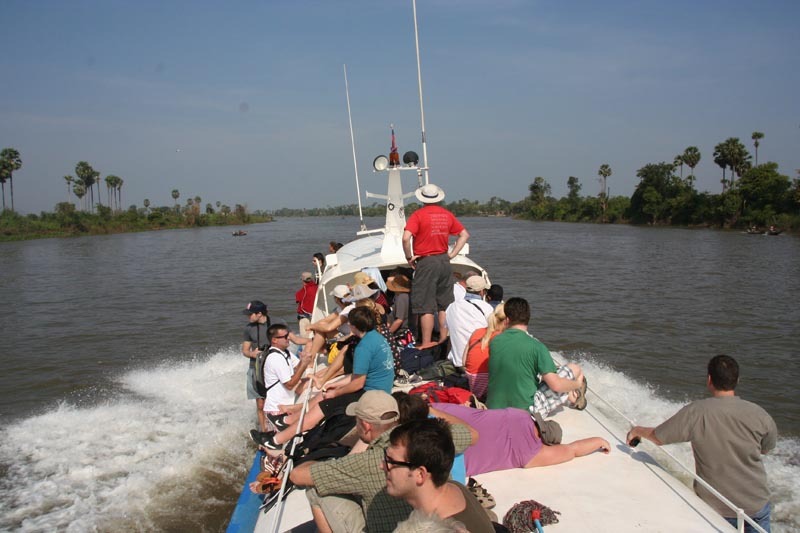 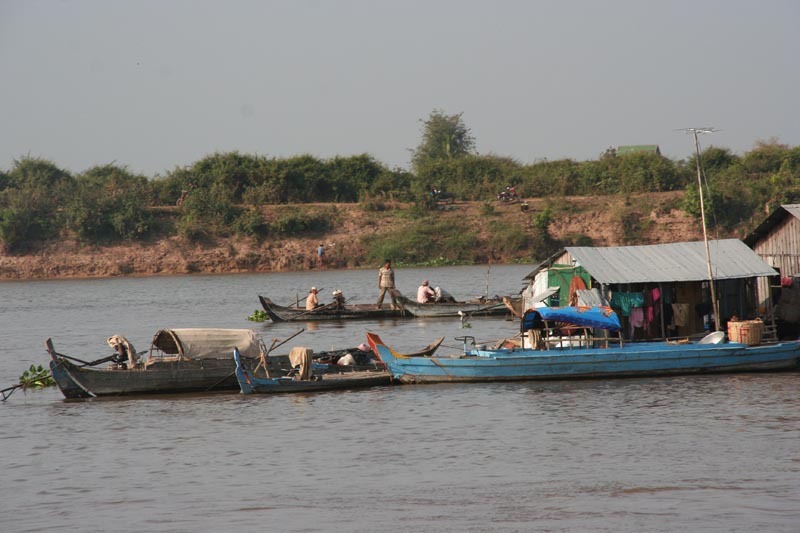 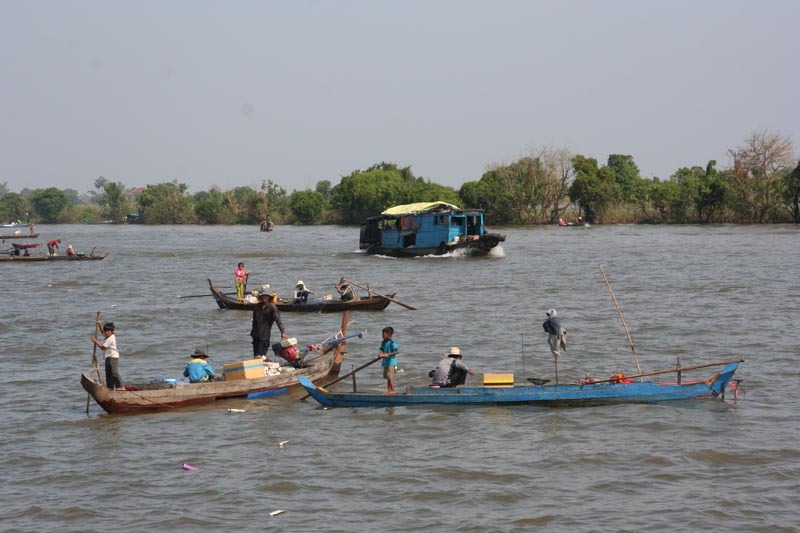 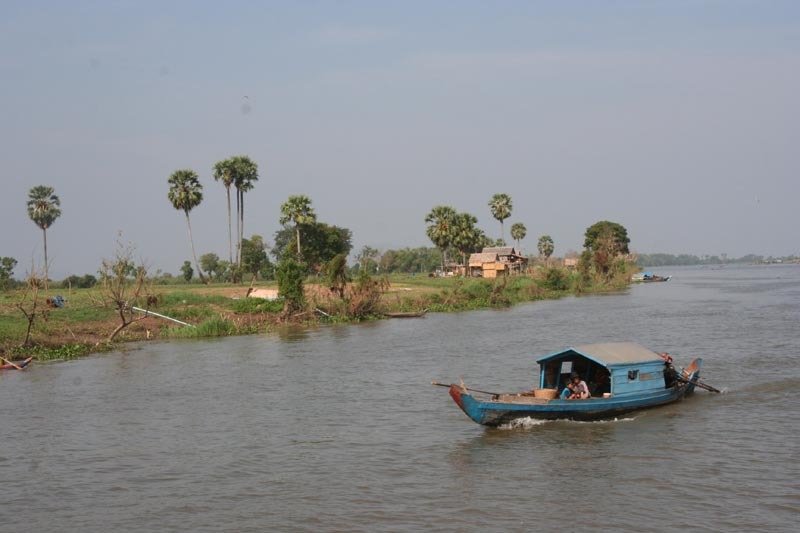 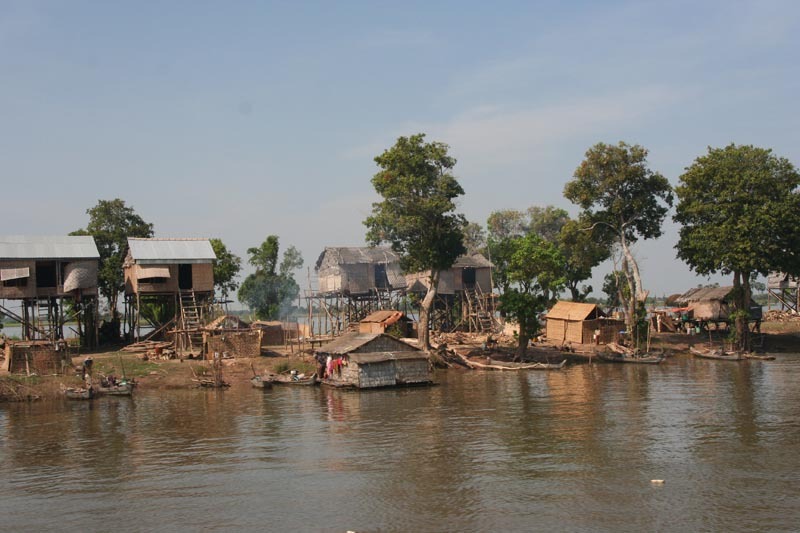 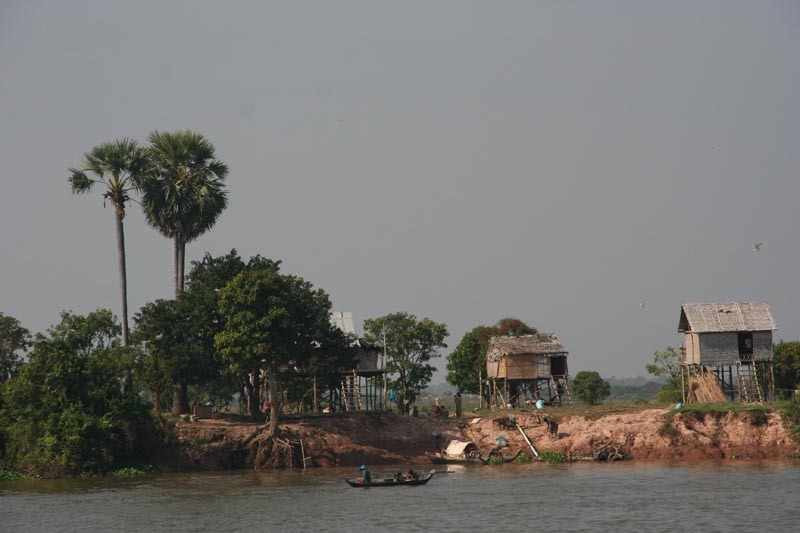 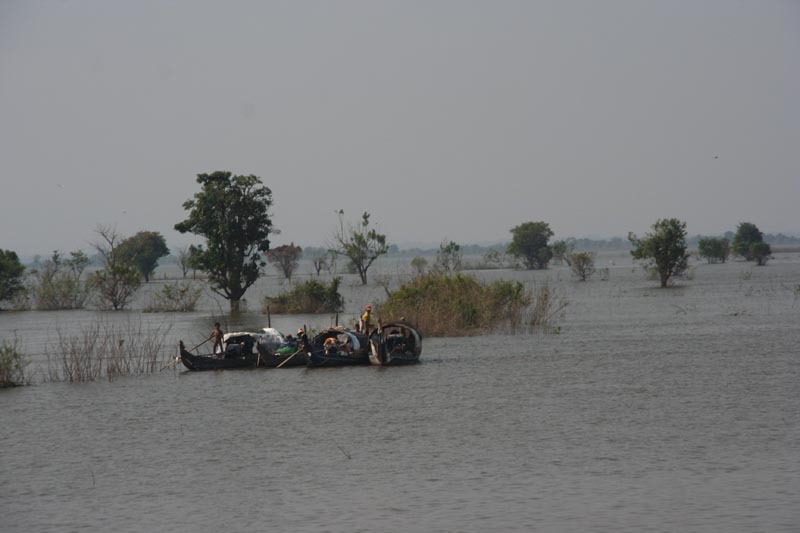 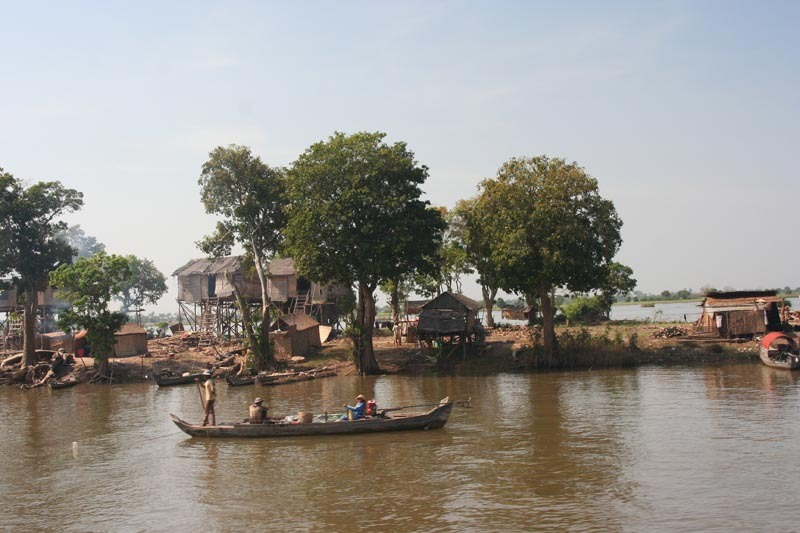 There is active fishing along whole Tonle Sap river. 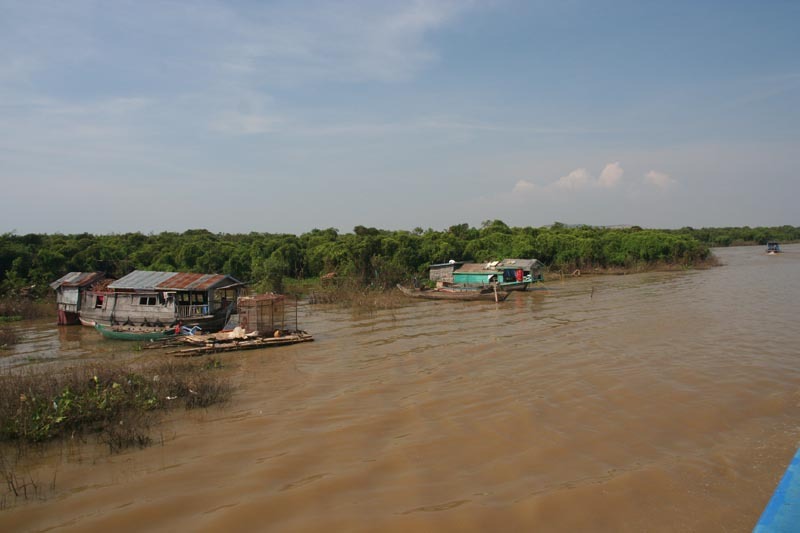 Last hours we cross huge Tonle Sap lake, trying to protect from direct sun at least arms and legs. 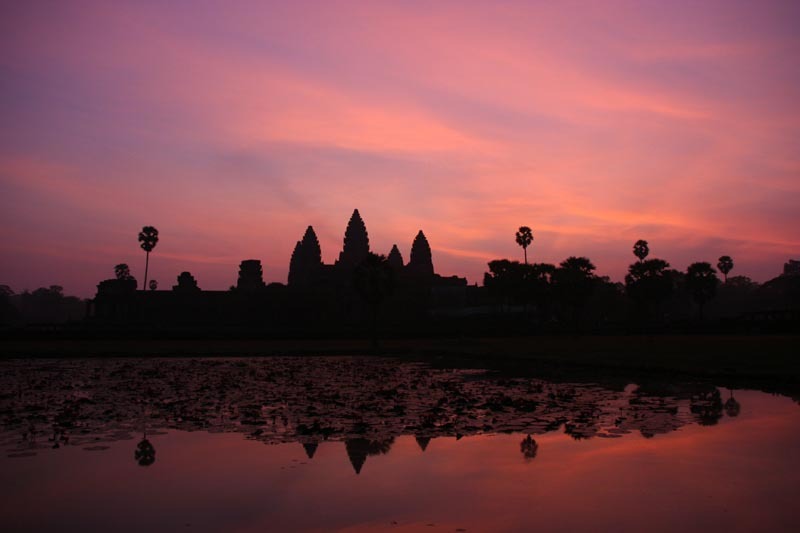 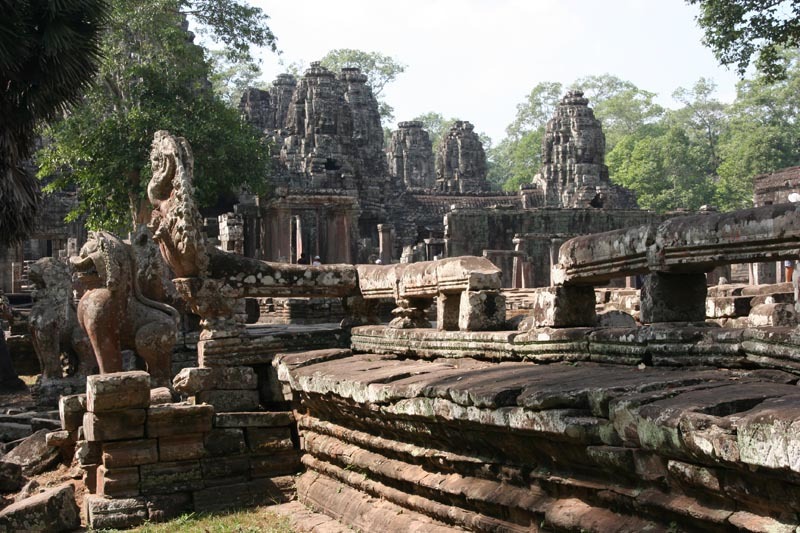 Hello Siem Reap – suburb of Angkor. 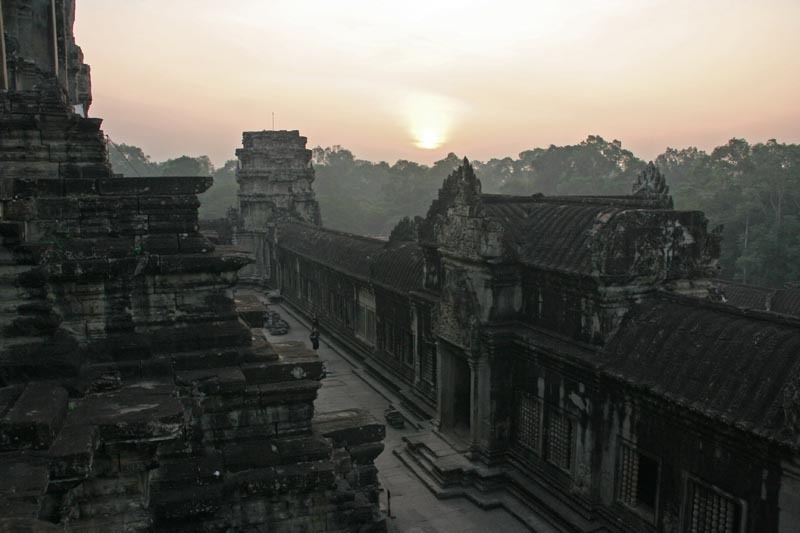 In morning mist we enter Angkor Watt – kilometers wide territory around mythological Meru mountain – physical, metaphysical and spiritual centre of all universes and residence of Lord Brahma. 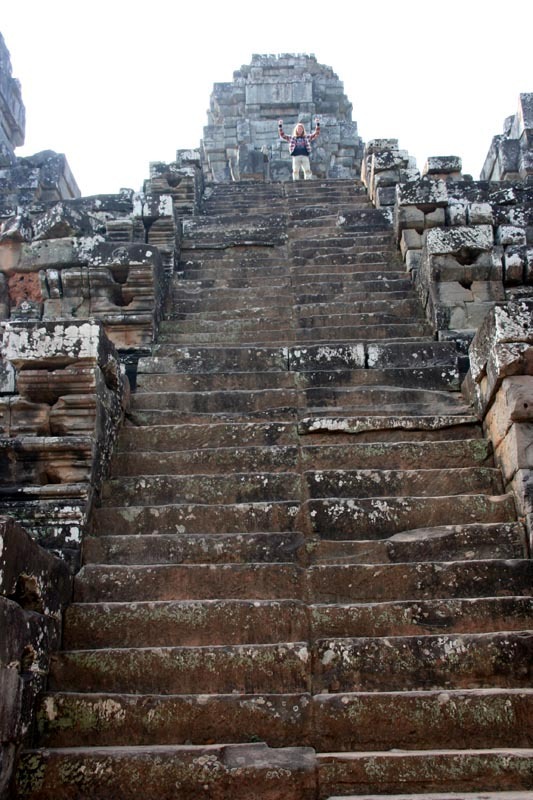 Phimeanaka impossibly steep stairs. 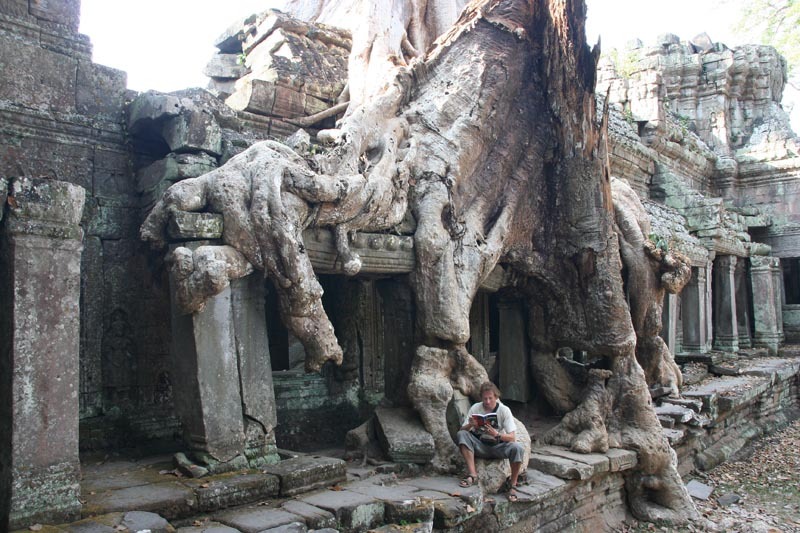 Maybe they are not designed for ascending? 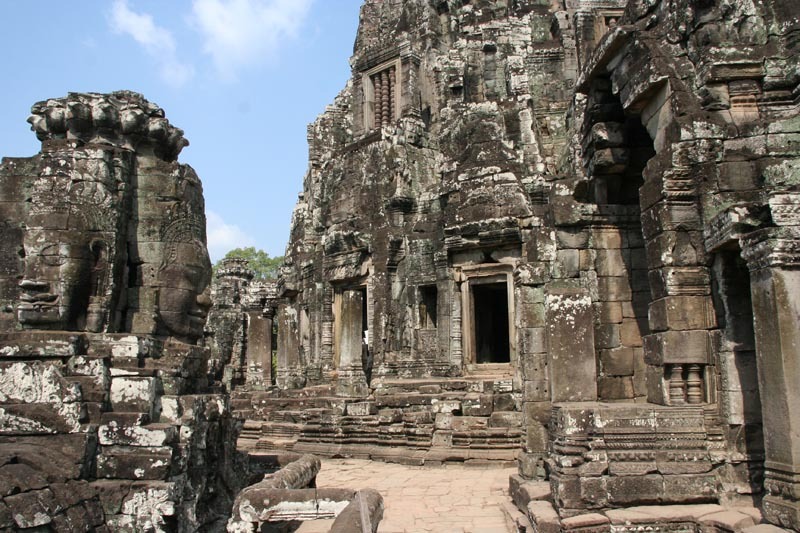 Bayon – impressive Buddhist temple built in 13th century in very centre of that time Khmer capital Angkor Thom. 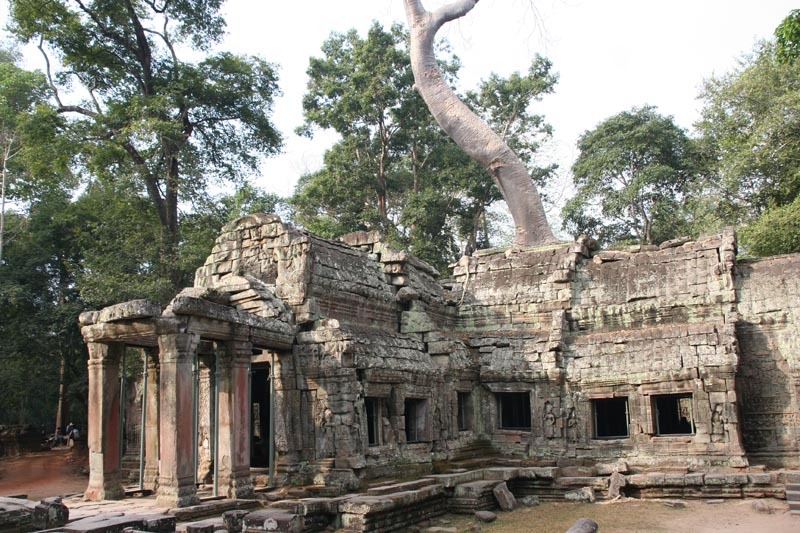 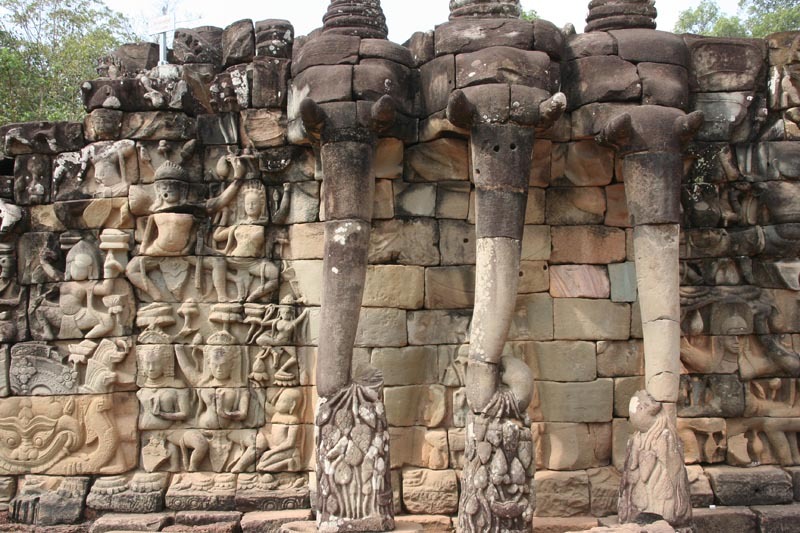 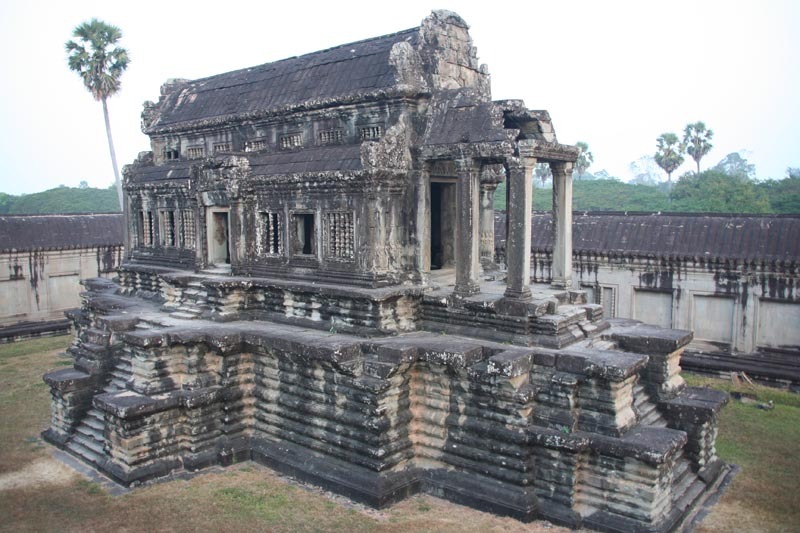 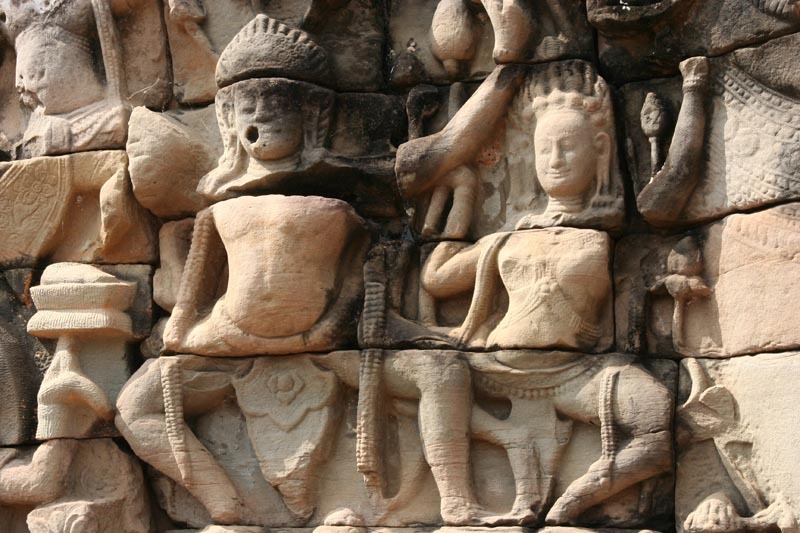 Temple was designed as symbol of power of Jayavarman VII. 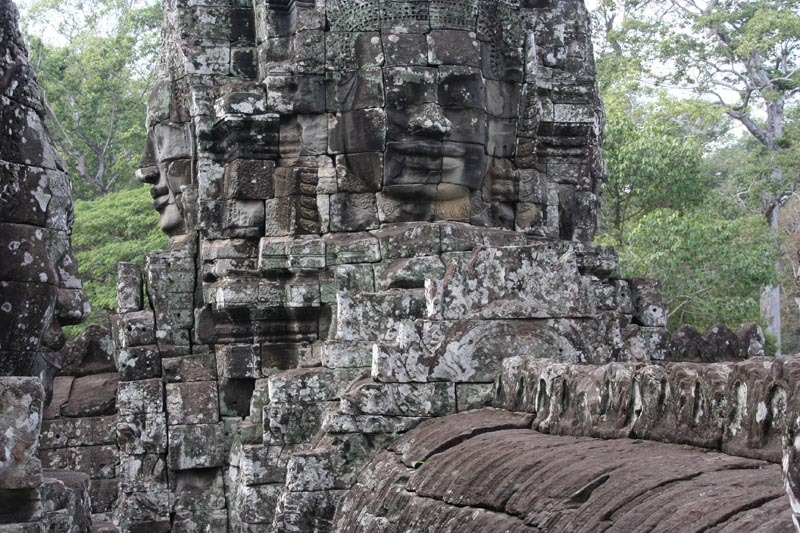 Ruler was represented by faces, being everywhere end seeing everybody. 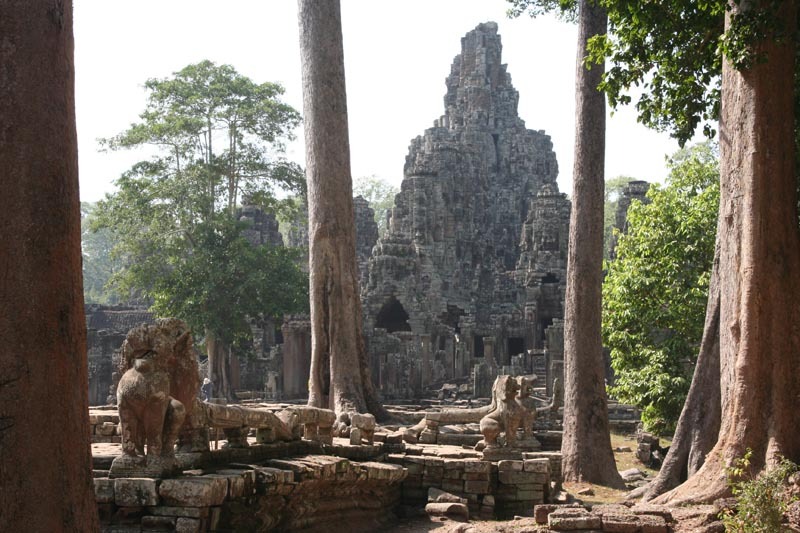 Try to imagine busy jungle town made on bamboo houses, inhabited by 100 000 people, with this giant temple in centre of it. 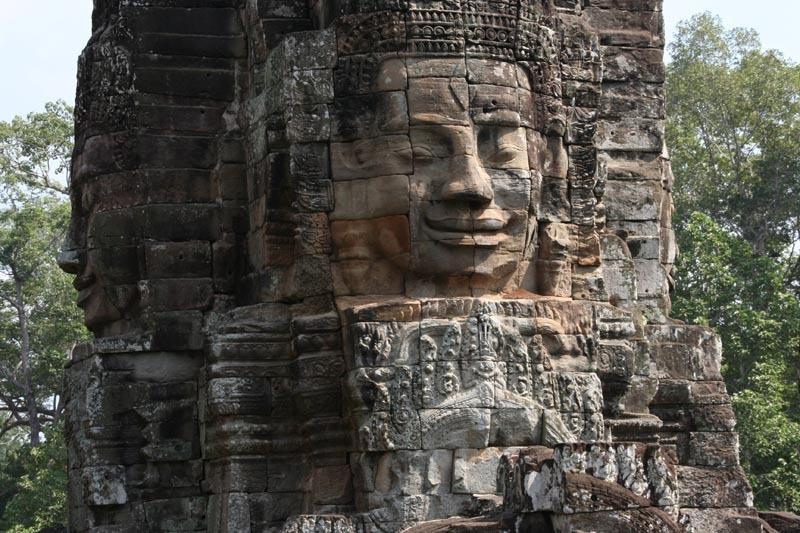 216 ruler faces were looking in all directions not to miss single sin of his citizens. 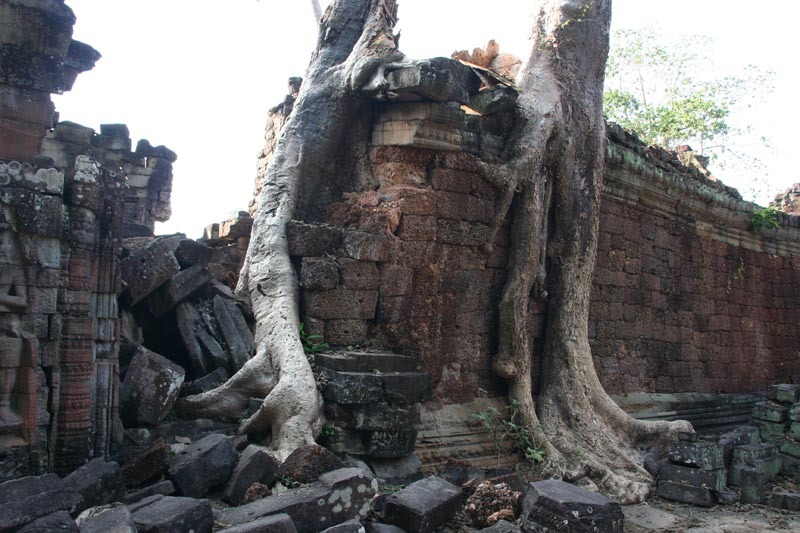 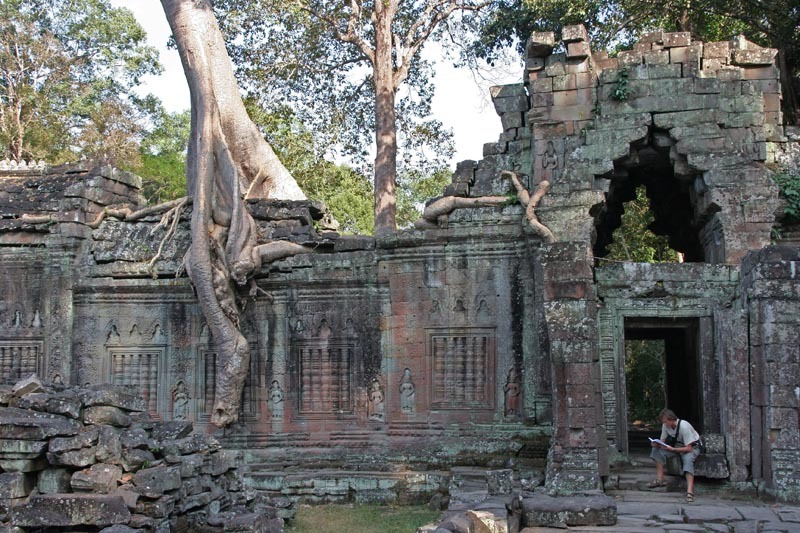 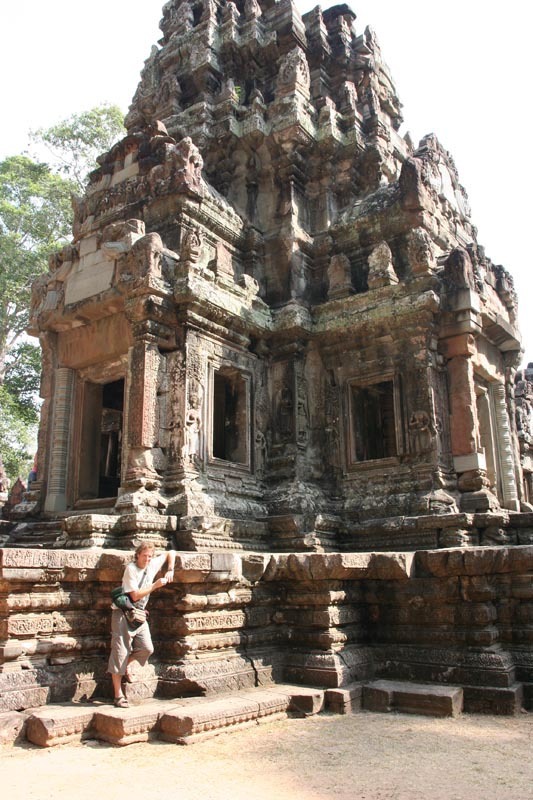 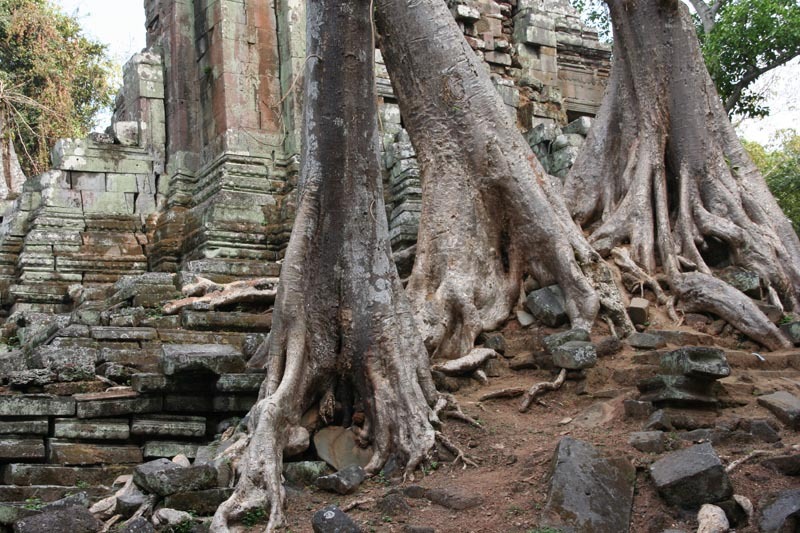 Finally for dessert we agree with rickshaw and go to Preah Khan – one more group of temples lost in jungle. 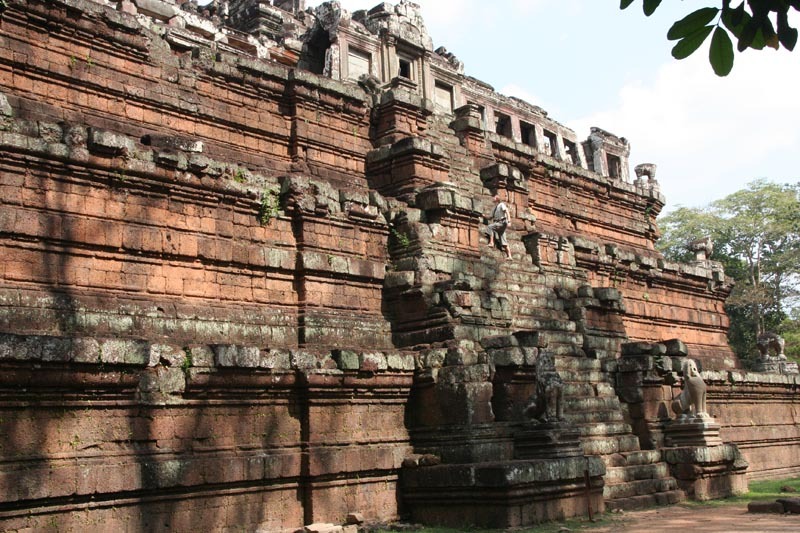 Jayavarman VII built it in 1191 in place where he conquer Cham invaders. 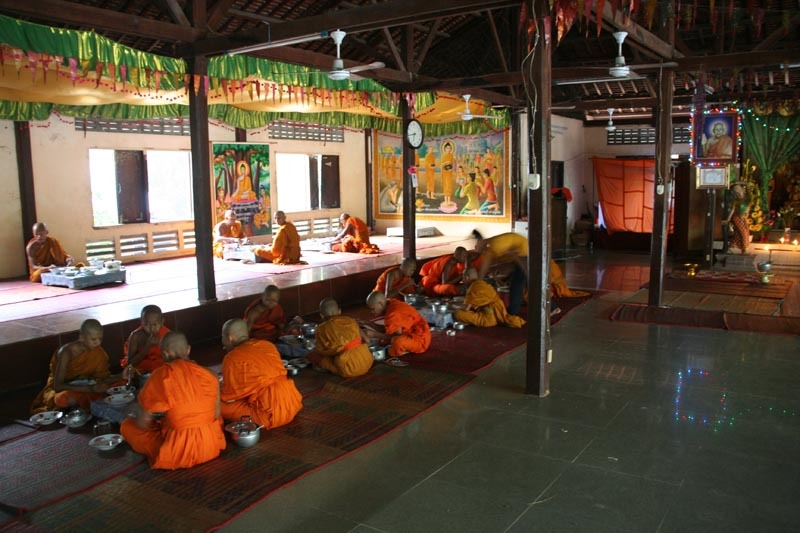 This was town in town with 100 000 officials and servants, Buddhist temples and universities. 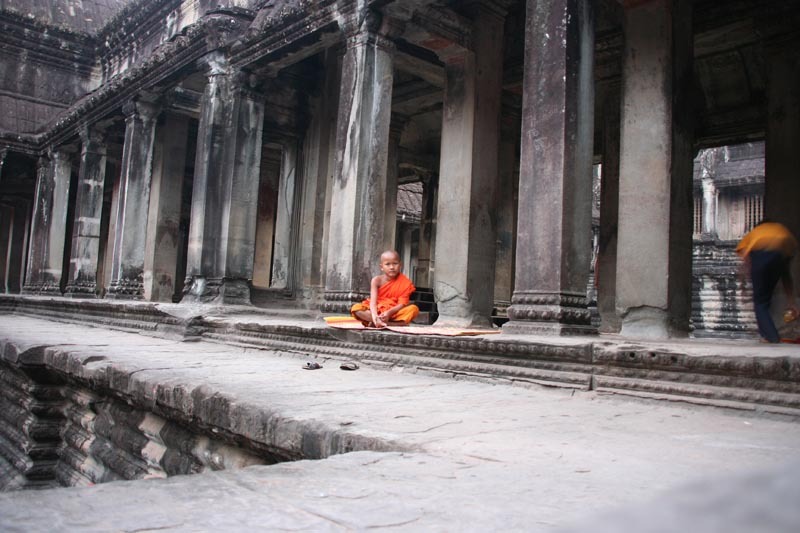 Here some guilty driver is washing off his sin – both from himself and from front of car, probably still having blood of victim… As soon as monk is over with this client, next one with Lexus is driving in. 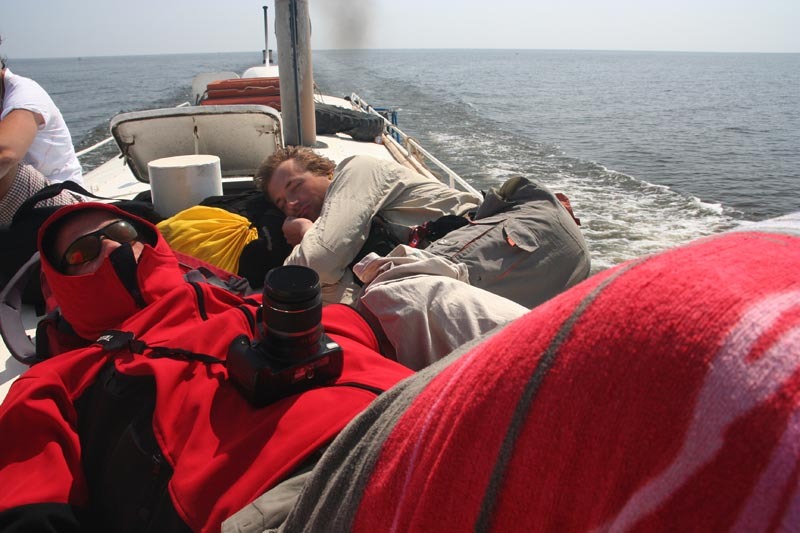 Finally we understand that 7 hours on roof of boat without sun protection is not a joke. 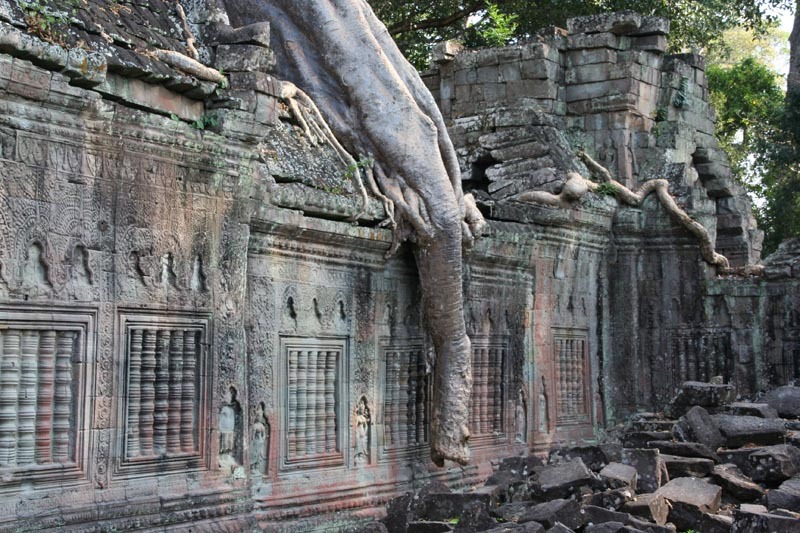 Next time should use SF cream.